Jessica McGuinty, after her Locks of Love hair cut. "My mother would say 'You're just a kid. You can't do anything about it," McGuinty recalls. "That always bothered me." So when she founded Jessicurl six years ago, she planned to give money to charity as soon as her revenues hit a certain level. Two years later, she was watching "Oprah" and heard Dr. Katherine Hamlin talking about a cause that really touched her heart — curing women in Ethiopia of fistulas, a horrible condition that can happen as a result of female circumcision. Soon after that, she saw an interview with Michael Franti, lead singer of the band Spearhead, who was speaking out about injustice in the world. He referred to his band as a human rights organization. "I thought that if a band can be a human rights organization, why can't my business?" McGuinty recalls. "I thought, 'What am I waiting for?' All of a sudden, my business became about a lot more than hair!" McGuinty put something on her web site allowing her customers to donate money directly to the Fistula Hospital. Since then, Jessicurl — with the help of its customers — has donated more than $10,000 to a long list of organizations, including Smile Train, North Star Quest Camp, Stop the Violence Campaign and Adopt a Mine Field. She regularly gets input from customers about causes they'd like to support. "Our customers thank us for giving them the opportunity to give," McGuinty says. "As one person, they don't feel that they can do much. But $10 and $25 really adds up and makes a difference." One of her favorite fund-raising endeavors is her "Jokebox," a large jukebox she takes to various events. When a customer pays money, she pops out and tells a joke. She charges to $1-$5, depending on whether the joke is a clean one or a dirty one. She calls it a a "totally Jessica thing," reflecting her offbeat personality while raising money for various charities. One of her most recent philanthropic efforts was to cut off her long curls for Locks of Love, which makes wigs for children with medical hair loss." For McGuinty, it's always been about helping others. The entire impetus for her company came from her desire to share a recipe she'd created for a curly gel, not to start a business. McGuinty struggled with her hair since puberty turned her straight locks curly at 14. She was called "Mushroom Head" and "Helmet Head" by her classmates. 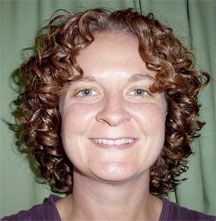 In her search for information and support, she came across NaturallyCurly.com, immersing herself in CurlTalk and making numerous cyber friends. Much of what they talk about, however, are products — mostly how they didn't work. One day, she came across a very basic recipe for a hair gel made out of flax seeds. "I remember thinking, 'Wow, how cool would it be if I could just make my OWN hair gel? I sure would save a lot of money!'" recalls McGuinty, who was working as a personal trainer at the time. So she tried a basic recipe, with less-than-stellar results. That experiment inspired her to tweak the recipe, adding other natural ingredients she had learned about, such as jojoba oil and glycerin. "The results were nothing short of miraculous," she says. " I was shocked that FINALLY my hair looked like I wanted, and I had made the product on my stove!" "It happened so organically," McGuinty says. "It wasn't my idea. It was really the people who encouraged me to do it. Pretty crazy, huh?" The company grew slowly, with McGuinty working out of her 600-square-foot apartment, making labels on her computer. 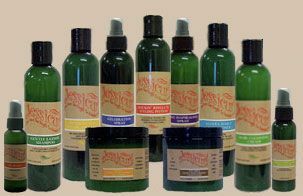 Soon requests came from customers looking for gentle shampoos and moisturizing conditioners. When customers requested a stronger-holding styling process, she turned to members of NaturallyCurly to help name the product. Annette Gaynes (CurlTalk's NetG) came up with the name Confident Coils, and the product was officially launched in Austin. The company now sells 11 hair-care products and a body-care line. "All of our products have been the result of customer input," McGuinty says. "I only want to do something when there's a really loud drumbeat for it. We feel that we now have a solid line with something for everyone." McGuinty's company now is a household word for many curlies, and her growing business reflects that. Since the company's birth, Jessicurl has moved its operations from the San Francisco Bay area to a 2,000-square-foot factory in Arcata, Calif., where products are tested on actual curls (not animals!). She now has eight employees. Her products are shipped to curlies around the world — many who learned about her through word of mouth. She was a guest on The Rachael Ray show in October of 2006, providing curly hair tips. Looking back over the past six years, McGuinty says it is amazing how quickly time has passed — years in which she has morphed into a successful, confident entrepreneur. "I've really learned that I'm an excellent thinker," McGuinty says. "We didn't have a handbook for how to start and grow a curly hair business. All our marketing ideas had to be original and creative. More important, McGuinty is proud that she's created a company that truly reflects who she is.